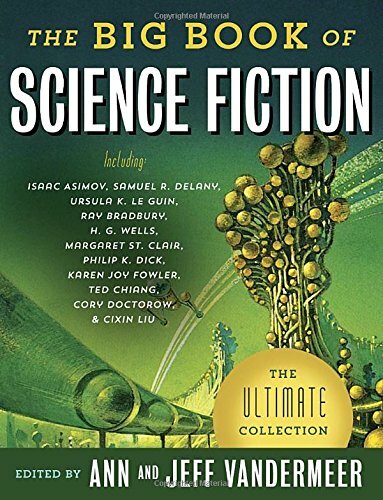 Amazon.com description: Product Description: Quite possibly the greatest science fiction collection of all timeÃ¢ÂÂpast, present, and future! What if life was neverending? What if you could change your body to adapt to an alien ecology? What if the pope were a robot? Spanning galaxies and millennia, this must-have anthology showcases classic contributions from H. G. Wells, Arthur C. Clarke, Octavia E. Butler, and Kurt Vonnegut, alongside a century of the eccentrics, rebels, and visionaries who have inspired generations of readers. Within its pages, youÃ¢ÂÂll find beloved worlds of space opera, hard SF, cyberpunk, the New Wave, and more. Learn about the secret history of science fiction, from titans of literature who also wrote SF to less well-known authors from more than twenty-five countries, some never before translated into English. In The Big Book of Science Fiction, literary power couple Ann and Jeff VanderMeer transport readers from Mars to Mechanopolis, planet Earth to parts unknown. Immerse yourself in the genre that predicted electric cars, space tourism, and smartphones. Sit back, buckle up, and dial in the coordinates, as this stellar anthology has got worlds within worlds. About: Quite possibly the greatest science fiction collection of all timeâpast, present, and future!